This is the time of year when all our work really comes into it’s own in this country. They do say that Charity begins at home. At K4P HQ staff and volunteers are super busy sending out your Christmas Card orders. Our sister charities Card Aid and Good Gifts also operate out of the same office and this is their busiest time of year too. 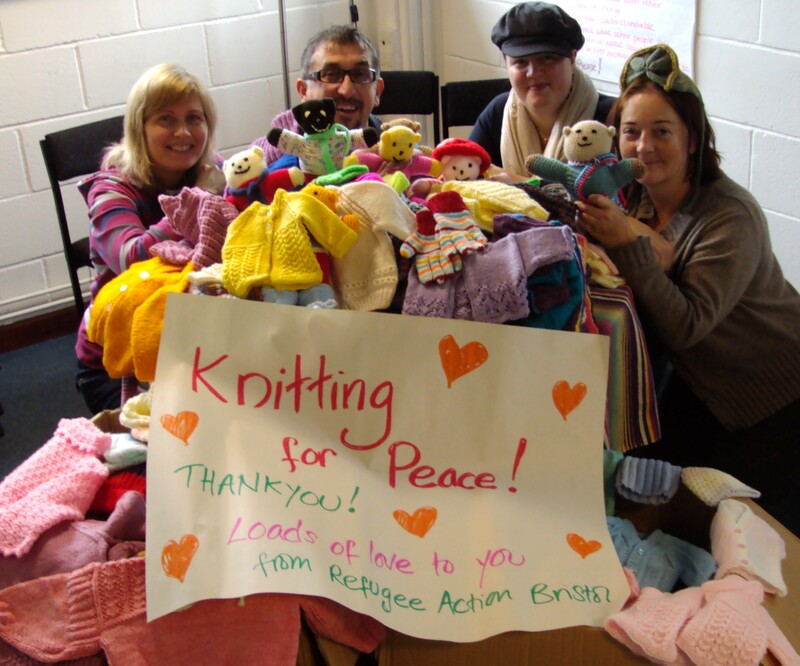 Here are Emma, Qerim, Elinor and Julia, just some of the lovely folk from Refugee-Action in Bristol with a huge pile of your knitting that we have sent for them to distribute. We’ve also sent your knitting to Refugee-Action in Birmingham and they in turn have been re-distributing to smaller local charities like Roshni, Brush Strokes and Narthex. This may seem long-winded, but it does mean that the people that can really benefit from help can receive it in a customised way rather than a blanket approach (whoops, excuse the pun). If you know of a charity that would like some knitted goods, let us know. Meanwhile, it’s not too late to order your Christmas Cards or book a place on our Knitting Holiday with Erika Knight. The proceeds all go towards our courier costs and keeping us going.